Effective communication has four logical steps, and each step must occur in order for the communication to run smoothly. Here is the list of steps in order of where they usually occur in most conversations. This does not mean the conversation has to be stepped through in this order, or that you cannot revisit each step if it’s appropriate. The word rapport is French in origin and is defined in the Heinemann Australian Dictionary as a feeling of understanding or sympathy. • That conscious feeling of harmonious accord, mutual responsiveness, and sympathy that contributes to the individual’s confidence in the communicator and willingness to work cooperatively with him or her. • The presence of harmony, trust and cooperation in relationship. 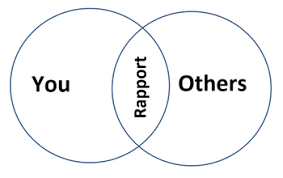 In short, rapport is a feeling of mutual trust and confidence between two parties. These are all small activities that will help to build rapport and trust and put the person at ease as it demonstrates your willingness to make them feel comfortable while you are with them. If you are a direct or straight to the point communicator, it’s possible you may not be comfortable with these steps to build rapport, or you may not see the value in it. Some people see perceive these small talk niceties as a waste of valuable time and prefer to get straight to the point. If this is your style, be aware that others may be intimidated by this approach, and the more relationship-focused communicators may find this way of beginning a conversation rude or arrogant. Such a beginning may immediately put the other person off side and could damage both long and short term rapport. If you are interested in being an effective communicator it will be to your advantage to make some attempts to find out what sort of person you will be dealing with and set the scene accordingly, in order to make them comfortable. If the aim of the communication is to develop long-term solutions to enhance and build the business or relationship, you will need the other person’s co-operation and buy in. If small talk skills are not something you are good at, take the time to practise rapport building. Even though it feels uncomfortable to start off with, it is a necessary step to take before you can safely discuss the issue at hand. As a successful communicator, it’s up to you to set the stage and build the relationship with the other person to a point where they have confidence in you and what you are saying. If rapport is overlooked in the initial stage of building a relationship, it is hard to win it back. Start as you mean to continue and make a good first impression. Be aware, if you have not built a successful feeling of trust and confidence in the person you are communicating with, it will be difficult to achieve their engagement in any solutions that might arise as the end result of the communication. Practise building rapport, notice how it impacts you communication and remember to keep in natural and authentic!